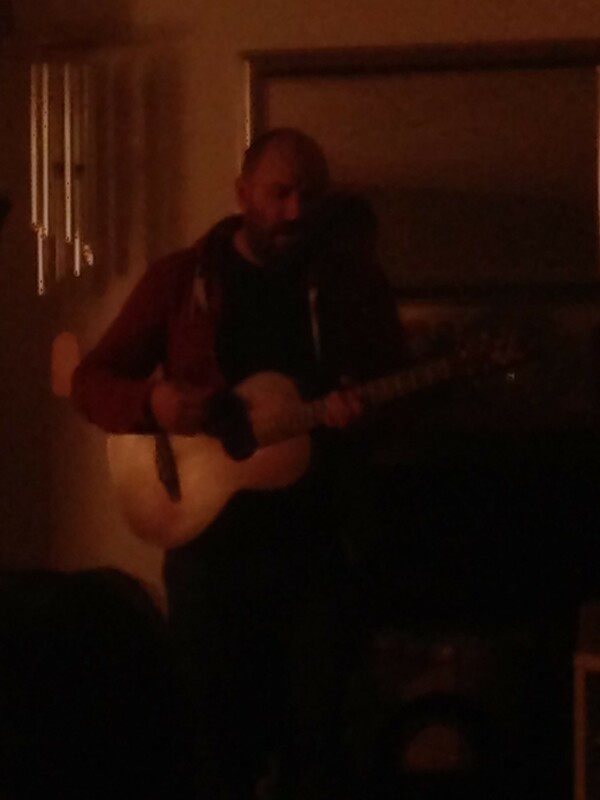 David Bazan is a bit of a live performance innovator. Deciding that touring in traditional venues, with all the costs associated with that such as paying the band, van to travel, etc., Bazan asks for hosts to hold small acoustic performances in fans’ living rooms. Hence, I pull up to a four-unit townhouse on a dark, slightly creepy, road in Allston, MA. I go around the driveway to the back, per the instructions on my ticket, when I run into a group of other slightly confused people looking for the apartment. It’s dark, and we’re all nervously hoping we don’t get murdered here. So, going to a stranger’s home to see a show is not a new idea. DIY house shows have been around for many years at this point. But, in general, those are in a dirty basement and it is more of a party. When our host Brad greeted us at the door, he took our names and offered us snacks. He had a cheese plate and a veggie platter. It was then I decided we (probably) wouldn’t be murdered tonight. Watching the end of the Patriots game, a ridiculous come-from behind victory, we waited for the show to start. 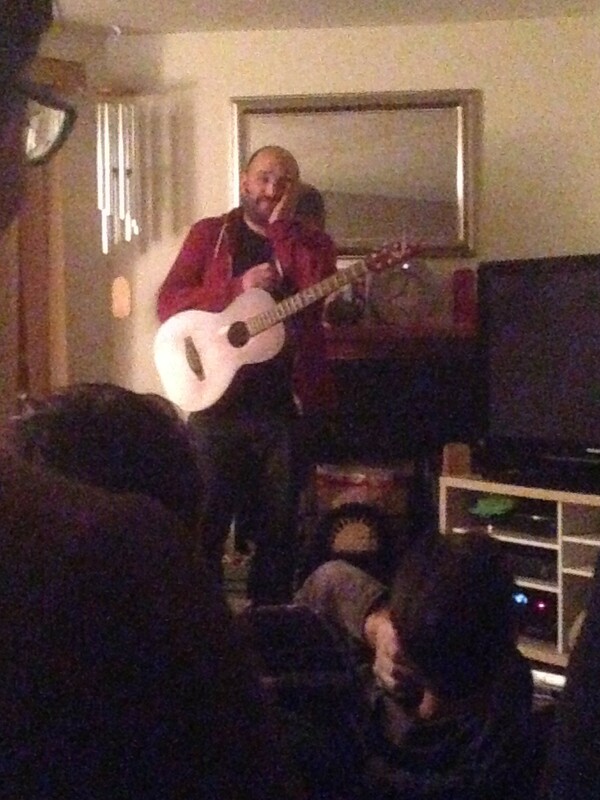 David Bazan walked into the room silently and picked up his guitar, maybe a third smaller than a typical guitar. Mumbling “Hey,” then launching into a Bazan Monthly song, the show began. Being in a living room, the format was really informal. Bazan took questions from the audience in between songs. Of course, in situations like this, there’s always someone asking stupid questions. For this show, it was Bandana Guy (guy wearing bandana on his head, took every break between songs to ask the stupidest things/request songs Bazan hasn’t played in 20 years). But other than Bandana Guy, a lot of the questions asked were really interesting. Bazan talked about how his Christian record label wouldn’t let him end the It’s Hard to Find a Friend record on a dark note. So the last three songs on the record had to be positive and he talked about regretting ending the album with “Promise.” He said he hasn’t played that song in over 20 years. Bazan discussed the future of his music. He talked about releasing a new album with the Passenger String Quartet he had previously worked with. Bazan thinks it will be all original songs. He is a lso working on an album made up of his Bazan Monthly songs that he is reworking. After a brief discussion of politics, Bazan does “Feel the Bern” but also “Felt the Nade.” He ended the show with a great acoustic version of “Strange Negotiations.” He talked about it being about Wall Street and the strange negotiation that the government has with Wall Street and corporations. It was a moving rendition and a very fitting ending to a cool night. To do a tour of shows in fans’ living rooms is a unique and interesting idea. If it helps David Bazan make money in order to be able to keep making great music I would definitely go again. And now that I am (slightly) more reassured that I won’t be murdered in a ritualistic living room sacrifice, I’ll be able to enjoy it even more.